CTU’s vision for Camden Town was to create a Naked High Street. A high street free of clutter where pedestrians are prioritised. Camden Town is bursting with visitors, tourists and employees – we thought it was only right that the street design reflects this. We created a plan to execute the new Naked High Street. It was divided in to self-contained stages which we offered to part-fund; ultimately, we managed to secure the entire £3.35 million budget. The result was transformative – from a vehicle-centric road layout in to wide pavements that could accommodate the huge footfall, allowing visitors to stroll along the numerous independent businesses that line our high street. Our proposal to redesign the streetscape of Cobden Junction came after works to improve Britannia Junction and High Street North had been completed. Pedestrian crossings were complex and indirect, and the junction could be intimidating for both cyclists and pedestrians. The public space which is home to the war memorial and the Richard Cobden statue was underused, surrounded by traffic and often attracted antisociall behaviour. We envisioned a design that would welcome pedestrians and cyclists, linking Mornington Crescent to High Street North with an attractive streetscape that would increase footfall and help to support our business community. Camden Town Unlimited, Camden Council and TfL developed the Camden Town Project to improve key streets in Camden Town. These three organisations, with the Mayor’s Regeneration Fund, funded the project. The vision of a new Cobden Junction with an abundance of public space, trees and seating was to become a reality. The results from the streetscapes work has been outstanding. 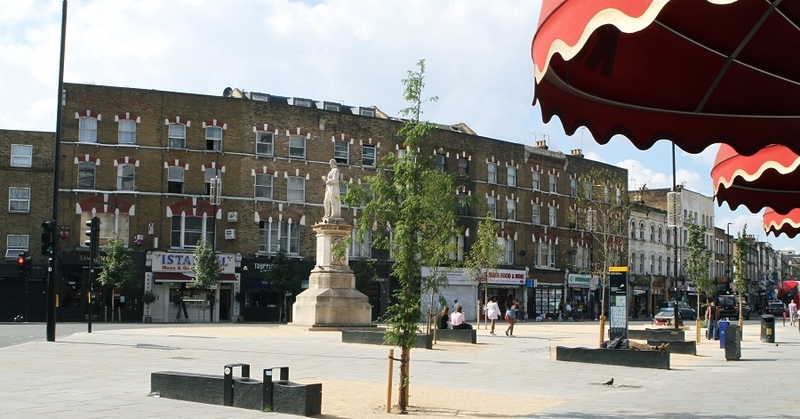 Camden Town now enjoys a generous public space with ample seating, new trees and the potential to host public projects and events, such as Points of View.